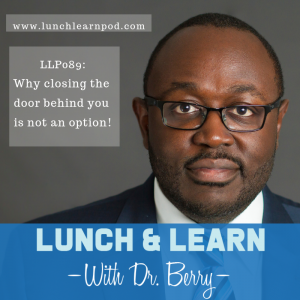 On this week's episode of the Lunch and Learn with Dr. Berry I get a chance to highlight an opportunity I had to provide some well deserving medical students with tips on how to succeed ERAS season. For those who may not be aware during the last year of medical school you have to apply to residencies using a standardized application (ERAS), and as a program director I have been in charge of reviewing all of the applications that come to our program. Over the past two years I have had the opportunity to see some common mistakes that medical students were making over and over again so I set out to correct it. Listen to the show as I discuss why I decided to venture out in the world of live webinars, what are the driving forces behind me when it comes to being a mentor and why I feel that closing the door isn't an option.